'Love Unlimited' (Richard Tasco, R. 2000). Seedling# 95-SDB-04. SDB, Height 14" (36 cm), Midseason to late bloom. Canary yellow (RHS 9A); beards tangerine, very light yellow at end; heavily ruffled; pronounced sweet fragrance. Seedling# 91-56-10: ('Wake Up' x 'Bisbee') X seedling# 93-14-2: (seedling# 91-18: ( 'Bisbee' x 'Tender Tears') x seedling# 91-68: ('Little Annie' x 'Bisbee')). Superstition 2000. From AIS Bulletin #317 April 2000 Introducing LOVE UNLIMITED (Tasco 2000) SDB, 14", ML. Sdlg. #95-SDB-04. 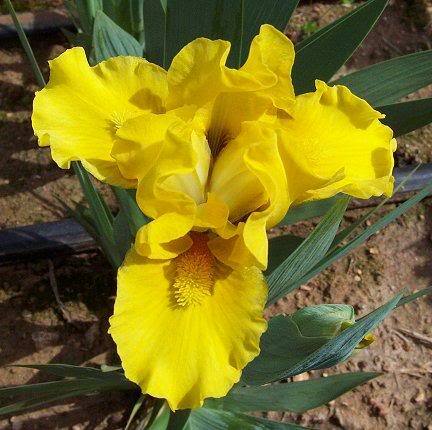 Heavily ruffled canary yellow self; tangerine beard with a very few hairs at the end tipped light yellow; strong baby powder fragrance; usually 3 buds. EC 1998. 91-56-10: (Wake Up x Bisbee) X 93-14-2: (91-18: (Bisbee x Tender Tears) x 91-68: (Little Annie x Bisbee)). $15.00. Superstition Iris Gardens.